Sometimes it seems if it weren’t for bacon, I might starve. Like I wrote in my song, “Bacon Makes Everything Better,” and it often makes my breakfast better. But not by in the traditional way of a side of bacon, but better with bacon fried rice. If you have just one strip of bacon, one egg and some old rice and any sort of veggies, you, too, can make a delightful breakfast. It never ceases to amaze me the quantity of fried rice I can consume. Maybe it’s because I grew up in New York, and Chinatown was my first experience of anything other than home-cooking. It’s almost like an addiction. My tip for you is always make extra rice. Keep it in the fridge or keep it in the freezer. If you invite me to your house, always have cold rice in the refrigerator and I’d be happy to make fried rice for you—and me. In a small bowl, scramble the eggs with a fork. In a large skillet, over medium heat, cook off the bacon and remove the bacon bits from the pan. Set aside. Pour in the eggs in the skillet and cook until set and remove from pan. Chop up the egg and set aside. Add the oil to the skillet and sauté the onions, garlic and ginger, until the onions are translucent. Add the vegetables in succession, from the hardest vegetables, such as carrots, jicama and broccoli, to the softest, such as zucchini, yellow squash or mushrooms, just as you would in a stir-fry. You can’t really do this wrong. Cook a few minutes to soften the veggies. Add the rice, bacon and eggs to the skillet with the soy sauce, sea salt and freshly ground black pepper. Cook for a couple more minutes. Remove from heat. Adjust seasoning, Toss in the herbs at the last minute and garnish with scallions, if desired. Serve with extra soy, if desired. I like to put chili paste or chilies in soy or in fish sauce and splash it over the fried rice. You must use cold rice for this dish. Otherwise it doesn’t work. You can also use cold brown rice, cold quinoa, cold barley, cold oat groats, cold buckwheat or cold noodles—whatever you like. You could also leave out the bacon—GASP, THE HORROR!! 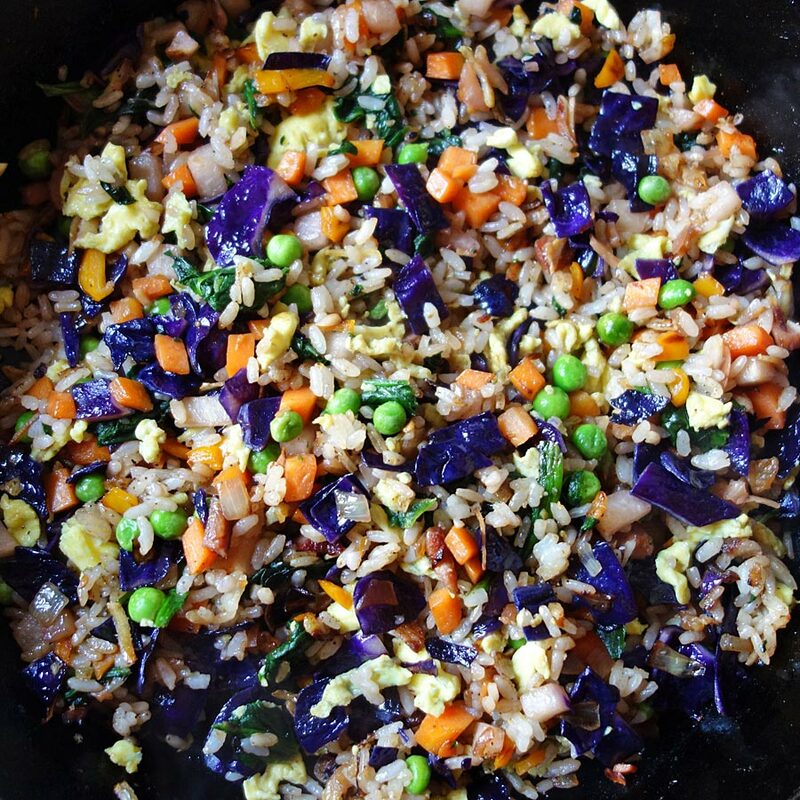 !—to make vegetarian fried rice. 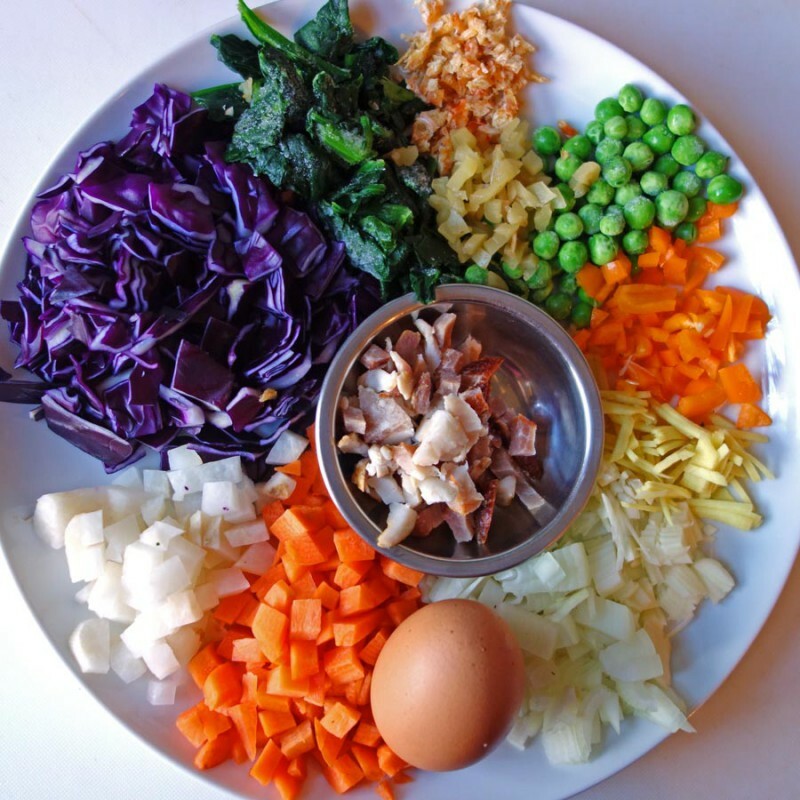 The photo is the mise en place for a bacon fried rice I made (counterclockwise, from left): bacon (center), red cabbage, jicama, carrots, egg, onions, garlic, ginger, orange pepper, peas, dried shrimp, preserved vegetable and spinach. Not pictured: rice, soy, S&P.